We have had our share of storm days this winter. So what to do when you are trapped inside? This lovely old farmhouse is crying for a lot of updating inside. So what can we do that won't break the bank? 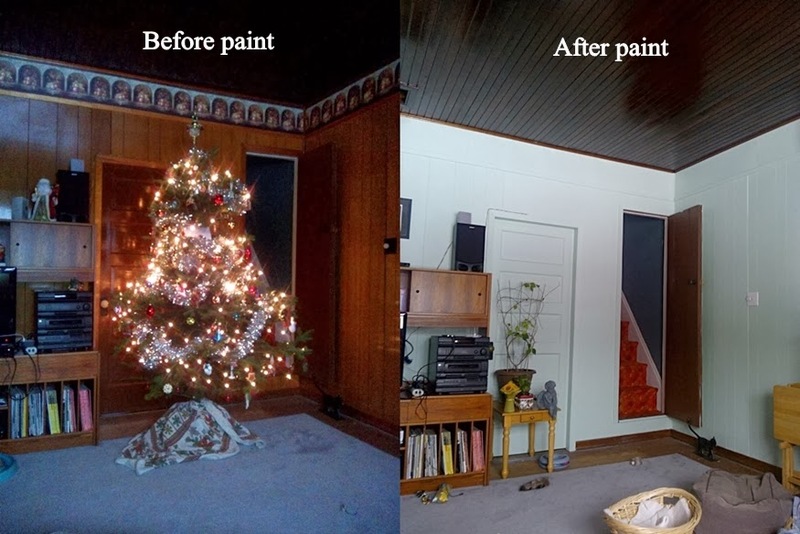 Why paint, of course! We spend most of our time in the living room or kitchen and so we decided it was time to do something about the living room. We didn't want to touch the lovely dark wood ceiling with it's old, shellacked, reddish brown wood strips. But when you have a dark ceiling with wood panelled walls topped with a dark wall paper border, it makes for a dark and depressing room. It took about a week to peel off the border and then scrape off the glue residue, patch holes and gaps and then prime and paint. But the effort brought out beautiful results in room that is a lot brighter and cheerier now. A real plus during a season when it's darker and the north facing windows aren't bringing in a whole lot of light. We didn't know quite how well it would turn out but the grooves in the panelling give it the look of painted bead board. And with a light aqua colour lending a soothing green-blue shade to the walls it gives the room a beachy, cottage feel and really makes the beautiful wood ceiling pop. It looks a little more like a light blue in the pic but it's actually more green than that. It's one of those borderline colours that doesn't photograph well but you'll get the idea. The next step will be to find some flooring to cover the plywood subfloor we are currently living on. But just having the walls painted has lifted the mood in this room considerably. 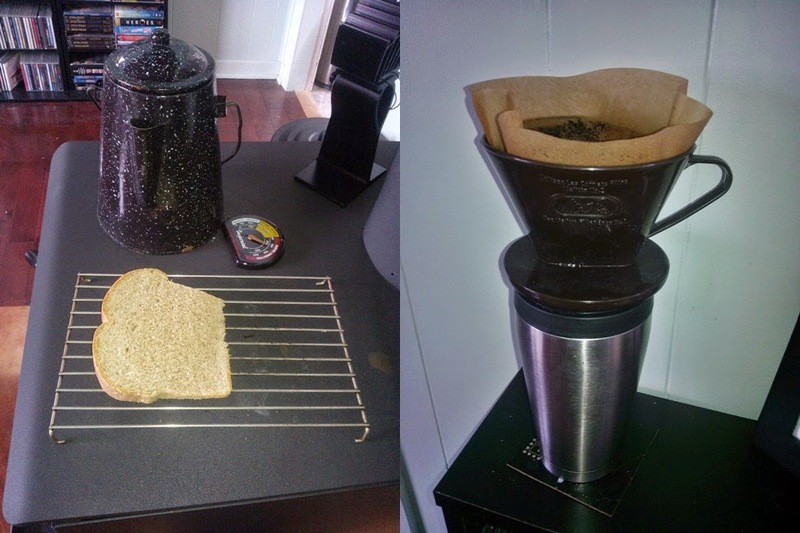 We're also conducting a recipe test here in the homestead. A friend of mine was gracious enough to share an old family recipe for wine shine as I call it. A little like making moonshine but it's wine. I didn't have the funds to get all the wine making equipment back when we harvested the grapes but I now have a whack of frozen grape nectar. So Diana shared with me a recipe that her folks used a lot back in the day, which involved using Welch's grape juice, an empty vinegar bottle some sugar and yeast to make a real quick and rough wine of sorts. Naturally I used my own grape nectar for the process and followed the recipe mixing my grape nectar with lots of sugar, warm water and yeast in an old vinegar bottle. Now the recipe calls for putting some cheesecloth over the top to allow gases to escape while preventing bugs from getting in and allowing the concoction to ferment for 4 weeks. Being that I'm suffering from a head cold and not thinking straight I figured all I had to do was remove the gauze and put it back on with a thinner layer. I pulled it off and a purple geyser of foam shot into the air spraying the curtains, me, the door frame and out the door to the kitchen floor. Yikes! Well all I can say is good thing it happened then. Normally we put Einstein the bird into the laundry room at night with a night light, so the poor fellow won't be startled by cats or other noises around his cage. I don't even want to think about the heart attack he would have had, had the thing exploded in the middle of the night covering him and the whole room with grape foam. Anyway, the mess is cleaned up and a SINGLE layer of gauze back on the top of the bottle, which rested comfortably and without incidence during the night in the kitchen sink. So I think it's safe now to find a spot for it in the laundry room. Four weeks from now I should be enjoying a bottle of rustic wine from our very own grapes...hopefully. Or...I could have some potent grape vinegar. Who knows? I'll keep you posted. And finally, let's end with a cute little pic to make you say, 'awwww'. In a previous post I mentioned connecting with an old school chum who is battling a pretty serious disease. She has been in the hospital for a few weeks now and while there, I have been looking after her cat, Muppet. 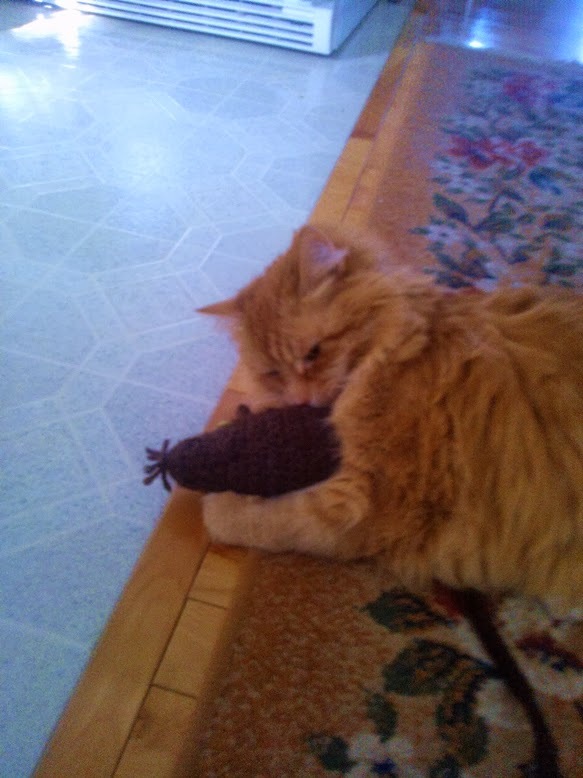 So here's Muppet playing with a catnip mouse I crocheted for her, so that she would have someone to wrestle and play with while alone in the house. Seems she is pretty spry for a 16 year old! Great painting job. The lighter walls are a big improvement. I'm a bit of an interior design junkie. That doesn't mean I do much of it, but I like to look at pictures and think about what I might do. Good luck with the wine shine. I look forward to your post about the tasting.